The Gran Hotel Domine in Bilboa is adjacent to the Guggenheim Museum. Breakfast was served in a penthouse lounge accessible via this unusual "Staircase to Heaven". Unique, maybe better in black and white? way cool--love the simplicity. nicely done. looks like a damned painting I saw once . . . well done. 9. Beautifully thought out, beautifully composed, beautifully shot. This would make a great print and/or poster. ok after five minutes i'm still stumped. I have no clue what I'm looking at. I would gues it is a hand formed concrete structure to to the imperfect curves. This is truely a dizzyingly wonderfull photo. The lights and shadows are very pleasing to the eye. Keep up the grat work. i love your image, and mean no offense in suggesting that i would like it more if it was rotated 45 degrees ccw. Great perspective, wonderful subject. Mightily effective abstract here. Very cool. Nice exposure throughout. What a great abstract. One of my 10s in this tough challenge. Beautiful line, light, shape, texture, classic shot, lovely! Not enough contrast/detail but otherwise great shot. Arresting image & a nice crisp shot. Tempted to give it a 6, of course. Or it could be a 9. But ...7. I'm a sucker for a really good abstract and this is one. I love the colors and the composition. 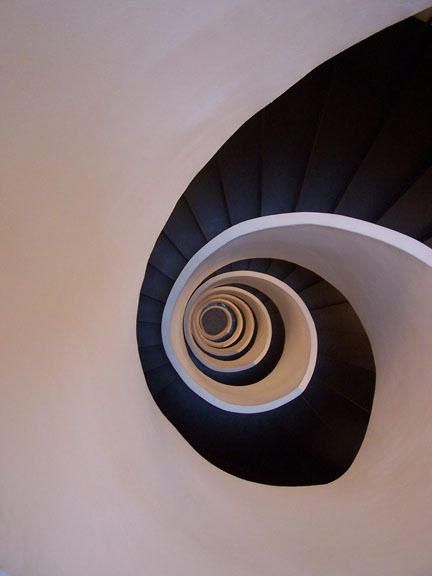 What especially appeals to meis the pattern of the black stairs inside the spiral. This is a 10 in my book. I'd love some more shadow detail here for the darker steps. The composition doesn't 100% convince me... I'd have cropped the photo leaving the centre of the spiral at one of the thirds junctions. This is an exceptionally great looking staircase though. Nice lighting. i like the composition. this seems like the inside of a shell, but as the title says it's not a shell but a ladder. Fantastic abstract. The balance of it is perfect. I have no nits. Message edited by author 2005-07-12 08:09:35. I love that only a small part of the stairs has light. Works very well. Proudly hosted by Sargasso Networks. Current Server Time: 04/23/2019 08:43:57 PM EDT.